Day three at sea dawned even more calm than the previous day. Just as forecast, we were in the middle of a high pressure system and the wind speed would be exactly zero. The trusty motor continued to carry us through the glassy seas towards Spain. Little did we know, but glassy seas in Biscay provides plenty of opportunity to sight whales! Just after breakfast, we passed a small family of whales basking at the surface. We haven’t found the field guide to properly identify them yet, but we think that they may be Finback Whales. They were probably about 40 feet long, grey, and had a small but pronounced fin towards the rear of their back. As we continued to motor across the Bay, we had more whale sightings, as well as distant sighings of whales breaching and blowing. We also saw numerous dolphins plying the waves. The sun warmed the surface waters to 23.5 C and we stopped the engine at about noon for a swim call. 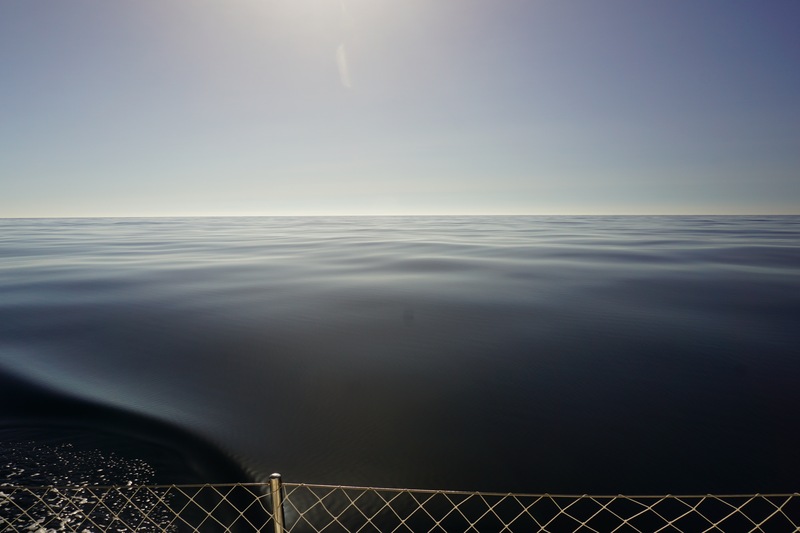 We drifted slowing in the calm sea for about an hour as we took turns jumping off the stern deck, the stern rail, and the cabin top into the very clear, but very deep, water. We freaked out the kids a bit by telling them that the closest land was 4000 m (2.5 miles) below us, and it would take hours for the camera to hit the bottom if they dropped it overboard. We have plenty of GoPro videos of shrieking kids (and adults) enjoying the swim (to be uploaded when we reach good WiFi). We’ve been motoring towards Spain in the company of two other sailboats that we didn’t know, but could see on the AIS display. Sometime after the swim call, one of the boats called us on the radio and asked if we had any extra fuel to spare, as they were running low and would appreciate a resupply. We replied that we had enough fuel to spare some, but we didn’t have a pump to get the fuel out of the tanks. One of our trusty crew on board, Rob, replied “I’ve grown up working on farms with diesel tractors; I’ve spent my life running out of fuel, we get the fuel to them!”. So, we aimed our bow towards their AIS symbol on the chart and about an hour later parked next to them on the calm sea. They inflated their dinghy and rowed over with two 10 litre diesel can and an improvised pump. The fuel was extracted and we both continued motoring towards Spain. The forecast is for another calm night and some tail winds to begin filling in after sunrise. We are hopeful that the wind will continue to fill and by mid-day (#4) we will have enough winds to carry us the rest of the ~200 miles to Spain. Remember that you can always track our progress on our maps on the Find Us! page of the website.